Here is a case of what during the cold war they called “spill over”: It began with work on randomizing airport security police patrol routines at Los Angeles International Airport while still maintaining the same level of protection. Now, after several other implementations, the randomizing approach to security is being tried in the waters around Boston. Typically, before attacking a target facility, terrorists (and criminals) watch the facility’s security routines. How often, for example, the guards patrol what section of the fence. For the facility under threat, such routines are dangerous, because they let the would-be attackers learn of windows of opportunity which become available between patrols. The new PROTECT system randomizes security. In the case of Boston Harbor, PROTECT schedules the operations of Coast Guard response vessels in a way that make it impossible for observers to predict their activities, without degrading the ability of the vessels to do their surveillance and protection work. After months of study, the PROTECT (Port Resilience Operational / Tactical Enforcement to Combat Terrorism) system began a two-month trial around Boston Harbor on 4 April 2011. PROTECT follows three airport security patrol randomization systems previously developed by TEAMCORE, a unit in the USC Viterbi School of Engineering Department of Computer Science directed by Professor Milind Tambe. 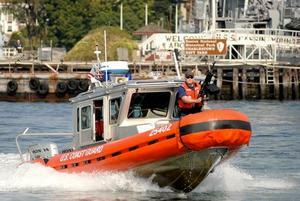 All of the three use computer applications of game theory algorithms to create schedules that fulfill the same level of law enforcement presence, but do so in such a way that even the closest observer cannot predict when or where an airport patrol team or vehicle — or in this case, a Coast Guard response vessel — will show up. According to Craig Baldwin, a senior analyst for the Coast Guard Research and Development Center, the initial phase of the project began in September 2010, when the USC TEAMCORE group began working with Coast Guard officials to fit the ideas in the system, originally developed for airports, to the demands of patrols by Coast Guard response boats. “The Coast Guard interest is to improve the deterrence effects of its patrol, by implementing an optimized randomized schedule for its activity,” Baldwin said. The testing involves a force consisting of five to ten response boats, plus one coast guard cutter, deployed in the waters around Boston. Baldwin said the experience of development going into testing with Tambe’s TEAMCORE group had been highly positive. All of the USC projects are funded through the Homeland Security Center for Risk and Economic Analysis of Terrorism Events (CREATE).